Does anyone remember in the late 1990s probably, a book on fabric-origami type of things, it had a little bag made from a 60-degree triangle, (facing and lining) with the 3 corners brought to a pyramid top, sewn up the 3 side seams, 3/4 of the way, and the three tips turned down on the outside and tacked with thread or button. it made a cute llittle pyramid bag with triangle opening at its top, for candies and whatnots. Anyone remember that little bag ? Google *triangle thread catcher* and there are recent internet pictures of the concept... thank you Fish ! On another note, here is a quick teepee bag pattern that I have made in every size possible, even one big enough for an overnight bag. They are super easy. *** There are 2 blank pages (3 & 4). cut two equilateral triangle -10" to a side - one for outside & one for lining. i use 12" triangle as it is nicer size. place triangles right sides together & stitch all around outside edge leaving about 2" opening. use the opening to turn right side out. top stitch close to edge on all three sides after folding in the edges of opening. sew up each triangle edge. - one to another about 2" up from base - you'll have a three sided little pouch with flat bottom. fold triangle tips down. attach button or whatever near tip to secure flap down. done. 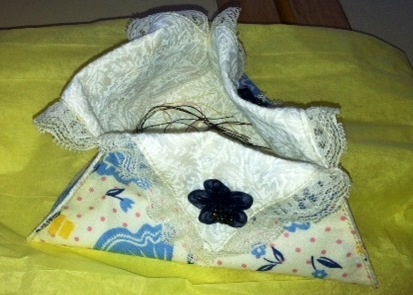 i am trying to upload one i made w lace & flower instead of button to hold flap down. i have another i did w flowers attached to buttons on the flap but can't get pic small enough to post here. i have also made one using light weight denim for lining. i give these as thankyou gifts & "just 'cause" gifts ..they are loved by recipients. getting ready to make several more for church ladies who give mr thier scraps for my miniatures. The pattern is complete. The extra pages are just blank. I have the original online print out of it, way before they became known as Hobo bags which was sold as a pattern and was a popular project to make a few years ago.